Traveling in 2015? Stay in the loop. Sarasota, Bradenton and Venice are the first cities in the US to have a majority of their theatres looped. Van Wezel, Player’s Theatre and the Sarasota Orchestra are all currently looped. Let’s Loop SRQ! is our advocacy effort to get Hearing Loop Systems into local public venues to increase access for the 145,000 people in Sarasota and Manatee Counties with hearing loss. We account for 16.1% of the local population and our incidence is the highest in the nation. This is the official sign designating a venue that has a Loop System. Note the capital white “T” in the lower right corner. This designates a system that sends the sound directly to a T-Coil, a tiny wireless receiver that the hearing aid must have to receive the sound. The Hearing Loop System is the only system that sends clear, superior sound from a microphone directly into a hearing aid or cochlear implant without interference. Hearing Loop Systems are the ideal solution for people who wear hearing aids or cochlear implants to hear better in theateres, churches, banks, restaurants and so many other public places. A hearing loop is the only system that sends the sound of a voice or instrument from a microphone directly into a hearing aid or cochlear implant for the clearest, most superior sound currently possible. Popular for over 40 years in many European cities, the system is starting to take hold in the U.S. 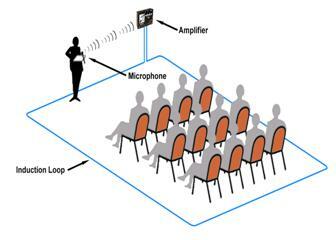 Hearing Loop Systems are very affordable and require no maintenance. The system simply entails an amplifier that is hooked up to an existing microphone or sound board that connects to an induction loop which is placed around the perimeter of the theatre, meeting room or area where an audience or congregation sits. The magnetic field created projects the sound directly to a T-Coil, a wireless receiver that acts a loudspeaker inside a hearing aid. 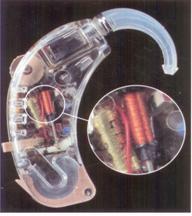 Most hearing aids come equipped with a T-Coil which is shown in the picture in the next section. If you have never used your T-Coil, see below. It is estimated that 70% of hearing aids in use today have a T-Coil. Nearly 90% of all new hearing aids come equipped with one. The primary exceptions are the tiny aids, especially the all the way in the ear models. which do not have the space for one. 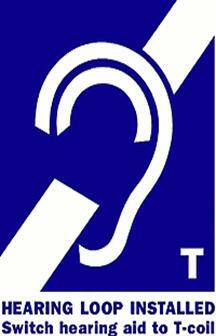 A good rule of thumb to remember is overall hearing aid performance increases with the aid size. Most T-Coils are accessible by flipping a switch on your hearing aid. In a few cases, the T-Coil is automatically engaged in the presence of a hearing loop system. In some other cases, your audiologist needs to activate your T-Coil bfore you can access it. If you have never used your T-Coil, we recommend seeing your audiologist to confirm you have one and to learn how to engage it. If your aid doesn’t have a T-Coil, talk to your audiologist about adding one. Once you have access to your T-Coil, we suggest coming to one of our monthly meetings where we always have a Loop System to support the speakers.